When I first started out as a freelancer I had no idea what I could write about that would make me any money. I felt I had no skills, interests or talents that could help me grow my business. I was good at writing and, well…that’s about it. (Heck, I wasn’t even sure I was good at that). Over coffee one day I told my mum about this problem. I explained that I couldn’t think of anything that was worth choosing as a niche, and I should probably give up before I even started. She just stared at me blankly, giving me that look only mothers know how to give. She pulled a pen and paper out of her purse and asked me to go through a few exercises to help me figure out what skills I do have that I could write about. These exercises changed my business because they showed me tens of niches I’d never have dreamed of writing in, but was more than experienced enough to do so. I went on to get my first client the next week, and have never looked back. Now I’d like to take you through those exercises to help you uncover those skills, niches, and interests you’re more than qualified to write about but have never thought of. Grab yourself a pen, paper and set aside at least an undisturbed 30 minutes to work through this. Exercise #1: What Have You Achieved In The Last Five Years? You’d be surprised at how much you’ve already achieved in your life, and how easy it is to apply to freelance writing. When I was 18 years old I was a personal trainer. I’d taken a lot of courses, read lots of books and worked with a large number of clients. But because this job rarely involved writing, and hadn’t worked there for years, I’d never given it a second thought. Yet once I started to use it to my advantage it helped me land my first ever client writing eBooks for personal trainers. I’d taken a lot of courses, read lots of books and worked with a large number of clients. But because this job rarely involved writing, and hadn’t worked there for years, I’d never given it a second thought. Yet once I started to use it to my advantage it helped me land my first ever client writing eBooks for personal trainers. You’ll have a tens (if not hundreds) of these professional and personal achievements in your past too. For this exercise, you’re going to make a list of everything you’ve achieved – no matter how small or trivial you think it is – over the last five years. What you’re really looking for is anything that you’re above a beginner level in. Where you could comfortably teach the basics to someone looking to learn about that topic. You don’t need to be an expert, just a few steps ahead. What industry/industries have you worked in or studied? Have you been on a long-term trip that influenced your life? Have you taken any of your hobbies to a high level? Have you won any awards or trophies? Try to drill down as deep as possible. If you feel you need to look further back than five years you can do that too, don’t worry about the minutia too much. All of the entries in bold went on to make me over $1000 each in my first few months as a freelancer. Like I said, you shouldn’t discount anything. Exercise #2: What Is Your Perfect Saturday? This exercise is one of my favorites because it makes you look at the small parts of your life where you don’t even realize you have a niche to write about. You’ll spend a lot of your free time doing and learning things you don’t even realize can be applied to your writing business. Even drinking coffee, going hiking and tinkering with your car can all help you find a niche to write about. For this exercise you’re going to write out your perfect Saturday on a play-by-play basis, looking at the details of what it is you’d like to do. I’ll go into more detail once you’ve written the list. 17:00 – Bedtime: Date night with my girlfriend. Get dressed up and head out into town, get some nice food from a new restaurant, sample a few craft beers, then maybe head to the cinema, the theatre or something eye-catching in the city. Okay, perhaps I’ve outed myself as the most boring blogger in the world. But, you can see the specifics of what I do quite clearly. That allows me to go through and question why I do what I do, and see if it fits into a niche. It’s an important part of my routine. But if I ask myself why it’s important, it isn’t because I just want to get up and shove some joe into a mug. It’s that I like the art of brewing coffee, I read a lot about brewing, pay attention to the latest machines and visit lots of coffee shops. So, this could be a credible writing niche. On the flip side, sleep was also an important part of my routine. But I don’t know much about it other than I feel good when I get lots of it, and a lie-in on a Saturday is a luxury I want to use before I have kids. So, this probably isn’t a niche I could write about. Go through your own perfect Saturday and look for the little nuances that are important to you. Is there something hidden there that you’re actually really passionate about, or where you’re at a higher level than a complete beginner? Add these to the rest of the topics you made a list about earlier and put them to one side. Your bank account can be one of the biggest clues to finding the skills you have that you could write about. It’s often where the most fun ones lie, too. There will be a small allocation of your budget every month that you spend on things you like or care about. This can be anything from books to video games, and magazine subscriptions to cookery courses. Everyone has something they like to spend their money on. If you spend $100 a month in a Thai cooking class, there’s a good chance there is a niche and a skill in there for you to write about. Not only do you enjoy it, but you’re at a higher level than a beginner is. There will be parts of this that carry on over to other types of cooking too. Another way to look at this is to explore your recent purchases on Amazon. (You can do this by going to Amazon > Your Account > Your Orders). Here you can see everything you’ve ordered over the last few months. 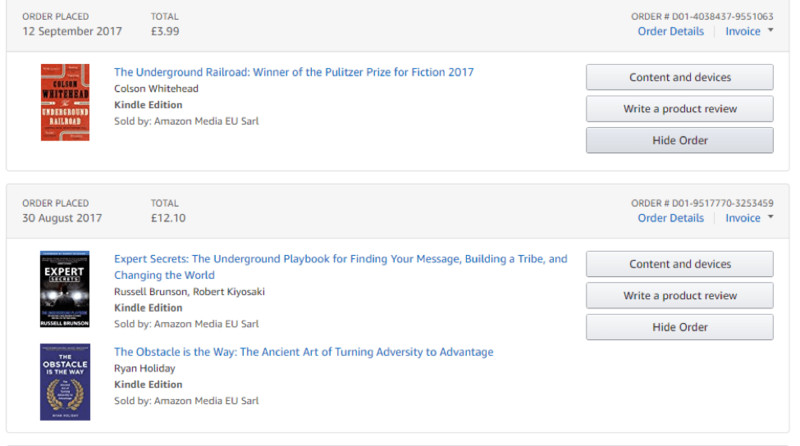 Even if you’ve only bought books you can dig deeper into, what topic are these books about, who did I buy these books for (and why did I think it would be a good present)? Who influenced me to buy those books? The books in the image above were all influenced by listening to business podcasts. Why was I listening to a business podcast? Because I love understanding how business works. Perhaps that could work for you. By now you should have a long list of potential niches you could work in. And I hope, if nothing else, you’ve surprised yourself with how many valuable skills and interests you really have. They’ll be too niched, too crowded or just not feel right for you to write about. And that’s okay, it’s all part of the process. In this step, you’re going to narrow it down to potential niches that you can work with. Before you carry on, sometimes it helps to put your list to one side for 24-48 hours and come back to it with fresh eyes. When you read it again you’ll find yourself saying, “What the heck was I thinking?” and cross off the idea right away. If you need this time, then take it. Either way, you’re to do a couple of read-throughs of your list to try and cut it down to three to five major niches you could write about. First time: Read through and take a second to think about the emotion behind each one. Do you feel comfortable writing about this, or is your gut telling you something is off? Second time: Open a browser and look for: blogs, Reddit subthreads, magazines, Udemy courses, Facebook groups and eBooks on the subject. Are there people openly talking about this subject? Third time: Do you feel you could write five to ten articles on the subject? Fourth time: If you have any topics left, which do you feel you could write the best articles on? Where do you have the most experience or knowledge to share? By the time you’ve completed these read-throughs you should have left yourself with a small, but targeted, set of niches that you can work with and use to start growing your business. I hope by the end of this article you’ve realized how much you know, and how much you’re really qualified to write about. The truth is that you don’t need to be a master in a subject to write about it. You just need to know more than a beginner reader. Then as your knowledge grows, so does the audience you can write for. And if you feel these exercises weren’t enough, you can also ask your friends what they think you’d be good at writing about. They’ll often pick up on nuances you can’t think of yourself. 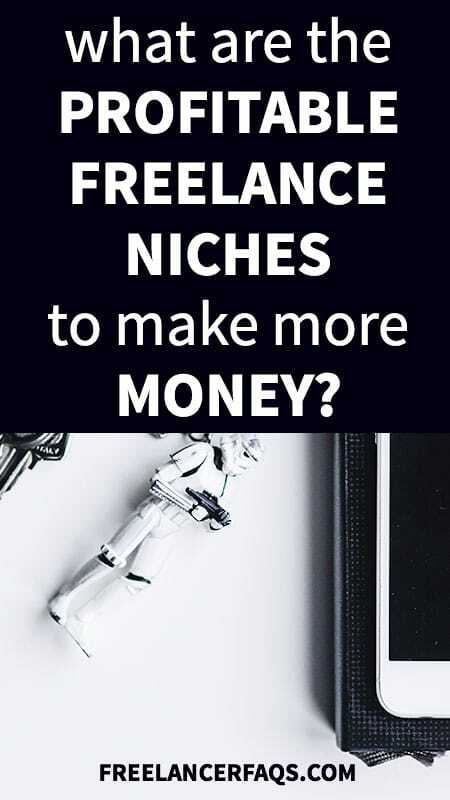 I really enjoyed this approach to finding your paying niche as a freelancer. So many of us have a hard time deciding what to market as a credible niche. But, by breaking it down with these exercises, you can find that you DO have a lot of topics to choose from! Thanks so much for your kind words! Even though writing may be your ‘main’ skill, you’re so skilled in other ways – that you often don’t realise – it just takes a little looking inward to find profitable niches you can charge for. All it takes is 30 minutes, a piece of paper and a pen! This is great information. I’ve been struggling with finding a niche that pays while blogging to build build an audience. I’m going to make my list tonight. I do have a question. I really like what I blog about. Is there a wa to make an income advising other Momtreprenuers. If words are being used to sell, promote or advise, there’s almost always a freelance writing market to go with it. Thank you for such an awesome post, James! It couldn’t have come at a more timely period in my life since I’m changing writing niches again. I couldn’t decide what I wanted to do since the avenues I’ve tried thus far weren’t profitable at all. Now that I know how to pick a profitable niche the RIGHT way, I’m going to give it another go. Thank you again, James! I do have passion for self-devolpment niche. This is a great post, James. From the past couple of weeks I’ve been narrowing down my niche and it’s more than one. I like to write about Relationships and everything related to it. I also like to write about health. I don’t know how lucrative a ‘relationship niche’ is. Should I still give it a try? What a great post! I do have one question: how did you turn your knowledge of basic Spanish into a paying gig? I took Spanish for 11 years (wouldn’t consider myself fluent as I’m kind of out of practice) and would love to know how to monetize that one! Thanks and, once again, great post! Same here Wendy. When I saw that on his list, I thought the same thing. James? Great Post. As a freelance writer the biggest mistake & learning lesson is to write passionately about niches that are not profitable or in demand. 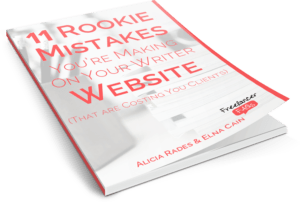 Elna Cain has a great tip on how to find a profitable niche-look on job sites and see what type of niche writers are in high demand. When I did this research and noticed that mental health/self improvement niche was not in high demand I realised I need to change it. Guys, make sure that not only you love the niche and have no problem writing about it but it’s also gonna bring good money. Otherwise you have an expensive hobby. I’m noticing there are always jobs for senior medical writers and bid writers. They want 100 years of experience and skills in mysterious anagrams. These could be good niches for someone, but it seems those someones don’t exist because they are always advertising for them. Great pointers–love the idea of looking at what I’m spending money on. It’s an angle I hadn’t really thought of.